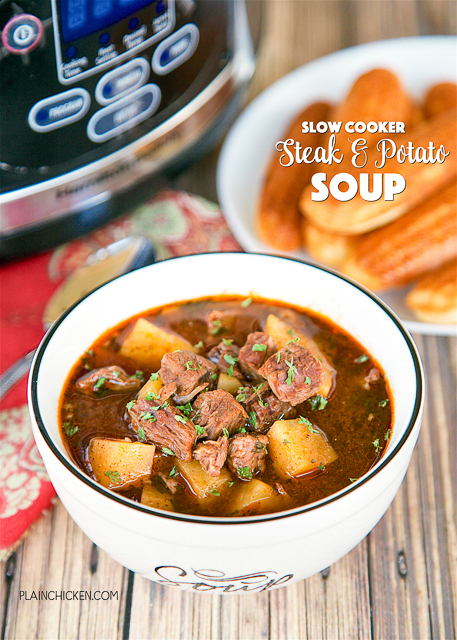 Slow Cooker Steak and Potato Soup - AMAZING! Everyone loved this easy soup!! Just dump everything in the slow cooker and let it do all the work. 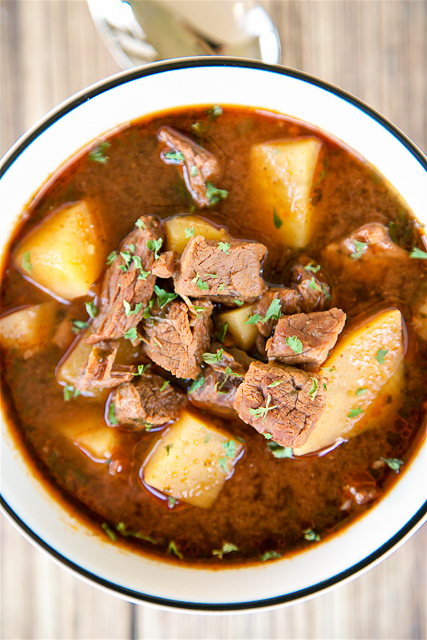 Stew meat, onion, yukon gold potatoes, beef broth, steak sauce, chili powder, cumin, cayenne pepper and parsley. Serve with cornbread for an easy and delicious weeknight meal guaranteed to please everyone! This Slow Cooker Steak and Potato Soup is comfort in a bowl. SO good. The best part about this recipe is that you just dump everything in the slow cooker and let it to its thing. It couldn't be any easier! The secret ingredient in this soup is steak sauce. I used a bottle of Shula's steak sauce, but any steak sauce will work fine. We absolutely LOVED this soup! It has a little kick from some cayenne pepper. If you don't like spicy food, you can leave it out. We had this for dinner and reheated for lunch the next day. It was great both times. All you need is some cornbread and you have an easy weeknight meal! This is already on our menu again for this weekend! Place all ingredients in the slow cooker. Cover and cook on LOW for 8 to 10 hours. This soup looks great, and could be like a stew and add more veggies if you wish, I know it is a potato soup but the extra veggies to your liking would be great.. I love dishes like this... quick and easy the cooker does the work as for cooking. I tried this tonight and it was a fail. The steak sauce taste was overpowering. Neither my husband or I could finish it. Followed the recipe exactly. My family made this last night for dinner and it was not good at all!! We threw it out and got subway. None of us could eat it. After reading comment above I decided to half the steak sauce and still it overpowered the whole soup. Sorry but this recipe was just not good. I made this tonight, it's all gone! My three kids and husband ate it all. I did brown the meat first, then dumped it in....I added a bit more water too. But the recipe is keeper for the cold January nights! os, we loveee A1! What is the serving size on this? A cup? I just wondered how much I need to make! thanks! 1 cup brown steak sauce like HP? what brand?